Phil Jones is also recalled to the United squad by Jose Mourinho. 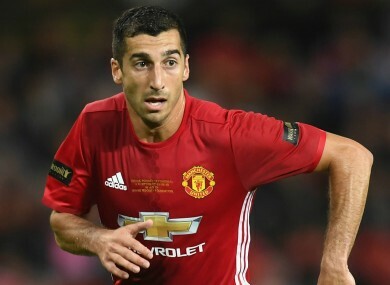 HENRIKH MKHITARYAN COULD return from his Manchester United exile after being named in Jose Mourinho’s squad for the Europa League trip to Fenerbahce. Mkhitaryan has become a peripheral figure at Old Trafford since joining from Borussia Dortmund during the close season and last featured for the first team in the 2-1 derby loss to Manchester City in September, when he was substituted at half-time. But the Armenia international is in the travelling party to Istanbul alongside injury plagued defender Phil Jones, who is yet to feature this term. Anthony Martial is set to feature in attack and Zlatan Ibrahimovic may have the chance to address his recent goal drought, but Chris Smalling is absent once more, with Michael Carrick, Memphis Depay and Antonio Valencia all remaining in Manchester. Bastian Schweinsteiger enjoyed a thaw in his relations with Mourinho this week as he returned to first-team training but the ex-Germany captain does not travel as he was not named in United’s playing squad for the Europa League. The 20-time English champions are level on six points in Group A with Feyenoord, who beat them 1-0 in September, while Fenerbahce are two points further back following a 4-1 thrashing at Old Trafford last time out. Email “Henrikh Mkhitaryan included in Man United party for Fenerbahce”. Feedback on “Henrikh Mkhitaryan included in Man United party for Fenerbahce”.